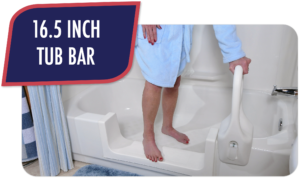 The new 16.5 inch tub bar provides a comfortable, safe support for stepping into and out of the tub. Handle is perpendicular to tub and has a nonslip grip. Product width adjusts from 3″ to 6.25″ and is an easy, tool-free installation. Perfectly paired with a CleanCut bath accessibility product and ships free with any kit purchase!